Let me preface this article with an update to Jennifer Anderson’s Shaving soap. I thought it would be a good idea to contact Jen in order to let her know I was going to finally release a review of her shaving soap. It’s been close to a year since I purchased the puck and she really wanted to know what I thought. During our conversation I had two issues which I disclosed to her. These issues have been corrected plus, her soap will be featured in a new subscription box called “The Shaving Room”. What a difference a year makes! Lately I’ve been cleaning up my office and during this process I’ve uncovered many items which went unnoticed for a long time. Now that I'm more organized I’ll be reviewing some of the things I’ve found and the first one is from Skyline Soapworks. A sandalwood shaving soap for men. The owner is Jennifer Anderson, Soapworks was born out of a need to find something to ease the symptoms of her highly sensitive skin as well as her eczema. Her soap making journey began about 12 years ago, but after several years she put the lye and oils away and started raising a family as well as a teaching career. Unfortunately, (or fortunately, depends on how you look at it!) her oldest son developed the same skin problems that she has, so back to the soap pot she went! and now lucky for us we can enjoy her creations. This puck comes wrapped in wax tissue paper and has a sticker type label holding everything together. 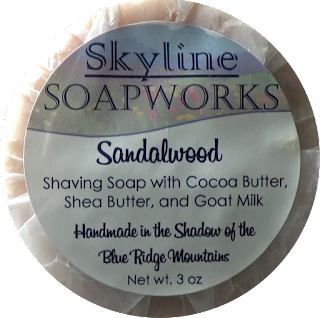 This is a tallow based shaving soap with ingredients like Shea Butter, Cocoa Butter and Goats Milk. I found this refreshing change to all the vegan shaving soaps that can be found on ETSY. I’ve never had a sandalwood scent with floral notes before. I found it strange but not a bad scent at all. The scent from the puck was on the light side and increased when lathering. After the shave it was still present and lingered for an hour or so. For the lather I used a Captain’s Choice bowl and my Zen Shave custom brush. 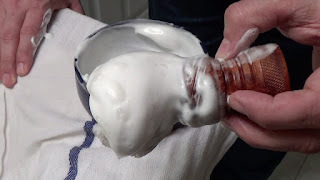 The soap was kind of thirsty so after adding the needed water I achieved a good lather and once it was applied gave great coverage along with slickness and glide. The post shave feel was good as well. So despite some minor issues a good shave was had. This review was done with the first version of the soap and since then has gone through some revision. You can expect a new Sandalwood scent and even more thicker, richer, creamer lather.